The temperature is up; the temperature is down; then up, then down...why you must be describing early Spring in Asheville. 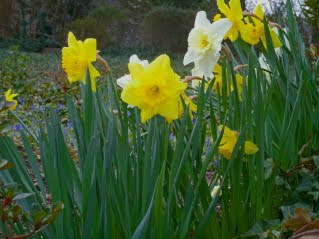 And our Bed and Breakfast gardens are all the more happy. 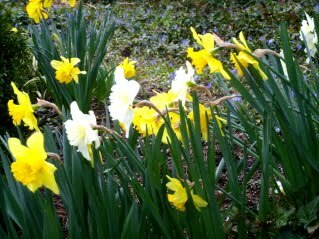 Daffodils, like tulips or azaleas, have varieties that may bloom in early Spring, while others are 'mid-season', and others are 'late'.The 'early' varieties are blooming now...all over Asheville. Whites, solid yellows, orange throats, large, tiny...all sorts. Bobbing in the breeze (bobbing enough to make photographing them a little tricky), the groups of flowers look as if they might be laughing or gossiping among themselves! Do have a look. 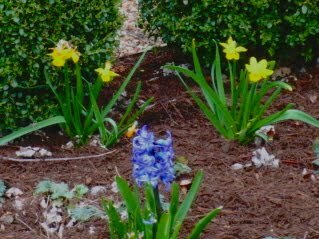 Another favorite thing in Spring, that also makes every plant stand out, is mulch. That's right, m-u-l-c-h...the brown stuff made of the best ground, aged, hardwood bark. And while that might sound a little like a description of a fine, aged wine...you'd be right. Secret formulas, lots of work and aged to perfection. When mulch goes down on your garden soil it will hold moisture in and keep your garden looking very spiffy, too. The really aged stuff will not be strong-smelling or drive you or your gardening helpers away. It just smells good like only rich, damp ground can! 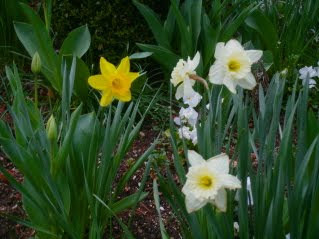 The gardens at this Asheville Bed and Breakfast are a constant source of delight as they change from day to day. See you in the gardens!